Now, I'm not a coffee drinker. I just don't like the taste. But I do really love the smell -- and the fact that caffeine makes skin look amazing. So is it any wonder that I've fallen in love with Pacifica Kona Coffee & Sugar Detox Whole Body Scrub? The oversized tub is filled to the brim with deliciously scented scrub that softens, smooths and nourishes the skin. I'm thoroughly impressed with how incredible my skin looks and feels every time I rub this scrub into it! Even my ashy knees and elbows have become smooth and supple. 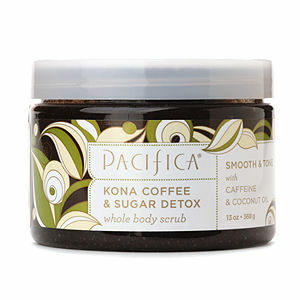 Pacifica Kona Coffee & Sugar Detox Whole Body Scrub retails for $28 at beauty.com. Great!! I have never used coffee as a scrub. You have given a great idea. Now i will surely use this one. Awesome! I really found it great and interesting post. Coffee can be so useful for skin I never thought. Thanks for sharing.